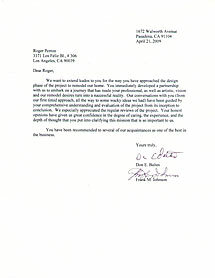 Baltes » Roger Perron Inc.
We want to extend kudos to you for the way you have approached the design phase of the project to remodel our home. You immediately developed a partnership with us to embark on a journey that has made your professional, as well as artistic, vision and our remodel desires turn into a successful reality. Our conversations with you (from our first timid approach, all the way to some wacky ideas we had) have been guided by your comprehensive understanding and evaluation of the project from its inception to conclusion. We especially appreciated the regular reviews of the project. Your honest opinions have given us great confidence in the degree of caring, the experience, and the depth of thought you put into clarifying this mission that is so important to us. You have been recommended to several of our acquaintances as one of the best in the business.